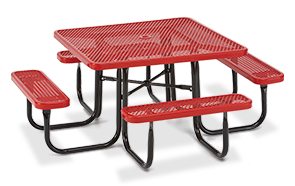 This 46" square steel picnic table creates opportunities for fun and inclusion. Constructed with commercial grade steel then coated with a state-of-the-art polyethylene finish, this classic design diamond patterned steel table is ready for tons of use. The MIG welded 1-5/8"O.D. frame is reinforced with a 1"O.D. support brace all coated in an impact resistant, UV stabilized powder-coated finish. The convenient walk through bench design allows for easy user access to enter and exit the bench. This square steel diamond table comes standard with a 1-9/16" umbrella hole, ADA accessible models available.